Customers' satisfaction is our utmost priority and thus, we deliver only certified array of products to them. Due to our commitment towards providing quality approved products to the clients, we source the raw materials only from the well-known and trusted vendors of the market. We are specialist in manufacturing cast PU tyred wheels bonded on C.l. / Aluminum / Steel centers for heavy and extra heavy duty applications. 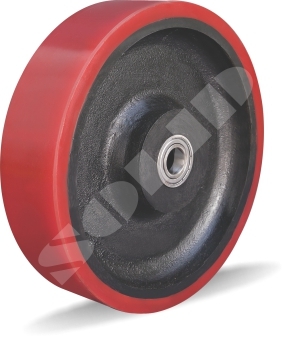 Polyurethane wheels and rollers are widely used in Automotive industries, Forklifts, Pallet Trucks, Stackers and in other power towed applications. Dia Width Bearing Load Kgs.